Wayne, PA – Bracket, a leading clinical trial technology and specialty services provider, announced today that 20,000 patients have been evaluated using the newest version of its industry-leading Rater Station eClinRO platform in clinical trials. Bracket’s eCOA solutions are used extensively by pharmaceutical and biotechnology companies to collect and manage Patient-Reported and Clinician-Reported Outcomes in clinical trials. Bracket also announced a new release of Rater Station Web, a platform used by sponsors and clinicians worldwide to centrally support the management and conduct of clinical trials utilizing electronic Clinician-Reported Outcomes in global studies. Rater Station Web allows sponsors to report on site and outcome data from their programs using a centralized, configurable portal. Rater Station Web is also used by clinicians worldwide to conduct blinded clinical review and quality assurance on clinical outcome data. This includes confirmation on subjective outcome scoring, web-based review of audio and video of clinical trial visits, and independent Central Rating and Central Scoring. Bracket will be demonstrating Rater Station Web and presenting new findings related to their eCOA solutions at the CNS Summit in Boca Raton, FL, beginning on Thursday, October 27. Bracket, with seven offices and more than 500 employees worldwide, is a clinical trial technology and specialty services provider dedicated to helping biopharmaceutical sponsors and contract research organizations increase the power of their clinical research data by leveraging core competencies in Science, Technology, and Service. Bracket eCOA™ is a flexible platform for electronic clinical outcomes assessments. Bracket RTSM™ is a best-in-breed, scalable and configurable clinical IRT solution for the life sciences industry. Bracket Rater Training and Quality Assurance improve outcomes through customized training and quality assurance programs. WAYNE, PA – Bracket, a leading clinical trial technology and specialty services provider with expertise in Alzheimer’s Disease, announced today a new study partnership with researchers at Massachusetts General Hospital (MGH) on the ‘Assessment of Brain Insulin Resistance in Alzheimer’s Disease Using an Insulin Clamp’. The researchers will utilize its proprietary CDR System™ in the study, which is both a product of the Bracket eCOA™ product line and the industry standard for automated assessment of cognitive function in clinical trials. The study will determine the effects of hyperinsulinemia on brain physiology, brain electrophysiological responses, and neurocognitive performance among subjects with and without Alzheimer’s Disease. Brain insulin resistance is emerging as a major mechanism of interest in Alzheimer’s Disease. While data from autopsy studies and animal research have shown that neurons are resistant to insulin in Alzheimer’s Disease, it has been difficult to directly demonstrate this in humans. Early-to-market with a flexible platform for eCOA and with specialties in Alzheimer’s Disease trial technology and services, Bracket’s CDR System provides clients with the most sensitive set of tests ever developed to assess improvements and impairments in cognitive function. The system assesses the major domains of cognitive function that are vulnerable to aging, fatigue, disease, pathology, trauma, diet and pharmaceuticals. To date, the system has been used in more than 1,200 trials across 50 indications. “Establishing new targets for therapeutic interventions in Alzheimer’s Disease is essential. This study is an exciting opportunity to explore a new pathway, and we feel that the CDR System is particularly well-suited to help identify any potential signals,” said Professor Keith Wesnes, developer of the CDR System and a consultant to Bracket. 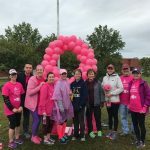 October is Breast Cancer Awareness month and in recognition of this important cause, a group of Bracket employees, the “Bracket Breasties” participated in the Making Strides Against Breast Cancer Charity walk on Sunday, October 9th. Sadly, most of us have a family member or friend who has faced the challenge of breast cancer. 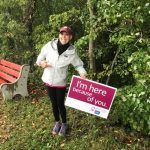 Which is why The Making Strides of Montgomery County Walk is so important as it brings awareness to the county. This event in total had 512 walkers and helped raise $70,655. We are extremely thankful that Bracket Breasties were able to raise $2,075 for this event. In addition, a number of Bracket employees showed up in support, despite the initial rain and bitter cold. By the end of the walk, the weather was clear and walkers were invited to enjoy refreshments and entertainment. It was great to see so many people from the community show up and stay strong for the cause!